By buying this product you can collect up to 2324 bonuspoints. Ångdriven snöplog Henschel typ DR, loket har digitaldekoder, längd över buffertar 24,2 cm, epok IV. Henschel Design Steam Powered Rotary Snowplow. Prototype: German State Railroad (DR) Henschel design steam powered rotary snowplow. Type 2`2`T 26 tender included. The units look as they did around 1986. 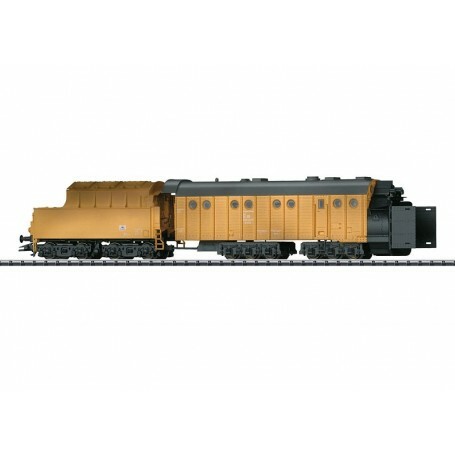 Model: The steam powered rotary snowplow has a digital decoder, a powered snowplow blade wheel, and auxiliary functions. The snowplow superstructure is constructed of metal. The handrails are separately applied. There is a detailed reproduction of the rotary snowplow's front housing. The side wings and guide blade are movable. The work lights and track headlights are lit and can be controlled digitally. The snowplow has a factory-installed smoke unit. The work lights, the snowplow blade wheel, and the smoke unit control will work in conventional operation. Length 24.2 cm / 9-1/2'. Highlights: Digital working model with light and sound functions. The rotary snowplow wheel can be rotated. Factory-installed smoke unit.